Of the 4 M’s of Management viz., Men, Material, Machine & Money (also known as Human Resources) play a very vital role in the success of the Organization in conjunction with the other 3 M’s. For any Organization going for an Integrated Solution, a functionally rich HR & Payroll Modules would enable the Management in managing its Human Resources efficiently & effectively and also for the Planning of Human Resources. The Human Resource Management Department can concentrate more on the core activities leaving the laborious work to the software. 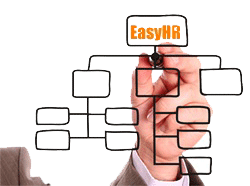 Apart from the above, it helps the Organization to assess the Employee Performance, enable timely decisions in meeting the Training and Recruitment needs and other Human Resource needs of the Organization w.r.t the Statutory Legislation and other Administrative activities.To make this possible, we have proposed for development of HR & Payroll Functionality specifically catering to the changing Organizations requirement. HR & Payroll Module has been developed with a view of providing a simple application / module of HR & Payroll that enable organizations implementing / already implemented Navision for meeting their Business Process requirements for HR Department.The HR & Payroll Add On provides organizations with a simple processing methods for computing salaries, Leave Management & Attendance Management. HR & Payroll Add – on is targeted at Organizations looking for simple application for computation of Salary and for managing day-to-day operations of the HR. This application is not targeted at companies having complex HR Policies, Salary computation & Attendance procedures. The implementation partner can customize the application provided to meet the needs of the Customer. HR & Payroll Add On is a cost effective solution as the dependencies on base Navision granules are minimum.